(1) Muslims make up 30 out of 31 most wanted terrorists, or about 97 percent of them. That's a pretty good indication of what Bernard Lewis' 1990 article famously called "Muslim rage" and why Islam-related issues have such prominence. 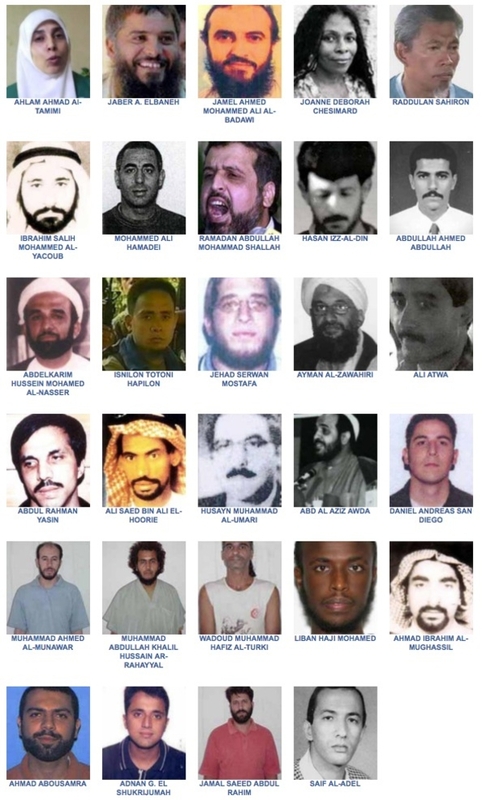 (2) Islamists make up 26 out of those 30; only the four perpetrators of the Pan Am 73 hijacking in 1986 (Rahim, Rahayyal, Munawar, Turki), all connected to the Abu Nidal Organization, are not Islamists (or at least were not in 1986). This predominance of jihad reflects the Islamist hegemony among politically extreme Muslims. (3) Ethnic Arabs make up 25 of the 30 terrorists. The largest numbers are 4 each of Lebanese, Palestinians, and Saudis, 3 each of Americans and Egyptians. Non-ethnic Arabs include 2 Filipinos, 1 Malaysian, 1 Pakistani, and 1 American convert. This high percentage confirms the sense that Arabic-speakers have the most pent-up hostility toward Americans. (4) Most attacks by these most wanted fugitives date from the 1980s and 1990s – Khobar, TWA 847, East African embassies, WTC bombing. Symbolically of this relative antiquity, the only American airlines attacked by them were Pan American and TWA, both long defunct. This points to the greater success since 9/11 in both foiling and tracking terrorism, thanks to greater resources and more diligence. 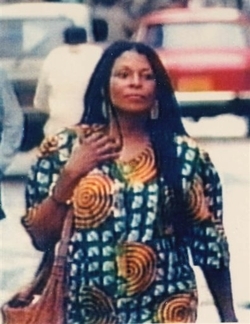 Joanne Chesimard (aka Assata Shakur). Chesimard's crime took place forty long years ago. The bureau notes in a press release that her crime took place on May 2, 1973, and it makes a point of this: "Today, on the 40th anniversary ..." It sounds more like a celebration than a tragedy. Likewise, it presents her presence on this as an admirable achievement, calling her "the first woman ever to make the Bureau's list of top terrorists." Wow. In fact, Chesimard perpetrated a crime, not a terrorist attack. The FBI's press release explains that she engaged in "the cold-blooded murder of a New Jersey State Trooper." How does killing a policeman who stopped her car for a motor vehicle violation amount to terrorism? This stretches the word terrorism to meaninglessness. The FBI prepares these lists hoping for help from the public; but Chesimard is not someone whom the public can help with; as the FBI puts it, she is "believed to be living freely in Cuba. She has been living in Cuba since mid-1984, where she attends government functions and her standard of living is higher than most Cubans." So, as an honored guest there, how will her capture be advanced by adding her to the terrorist list? And then the topic of this blog: a quick search does not turn up whether Chesimard identifies as a Muslim. If she does, then the terrorist count reaches 31 out of 32. If not, then her odd addition to the list would seem to be an attempt to dilute the Muslim component I pointed out two days ago. Who else might the FBI add: perhaps an anarchist from the 1890s still on the loose? Chesimard should not only be jailed but should be executed for the 1973 murder. That said, she is 65 years old and writing books in Cuba, a threat to no one. Her sudden inclusion on the terrorism list makes no sense on a list that should focus on the "armed and extremely dangerous" thugs who live among us. The terrorism list is poorly crafted and in dire need of both definition and updating; it is an embarrassment. 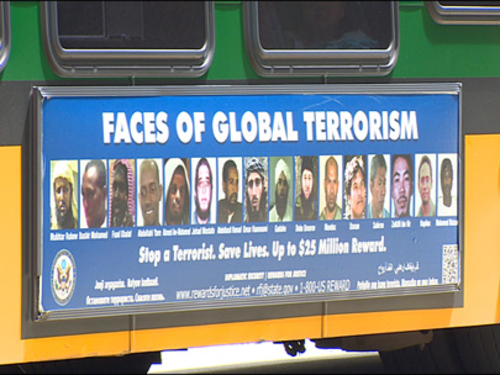 June 20, 2013 update: On behalf of the U.S. Department of State's Rewards for Justice program, the Seattle area Joint Terrorism Task Force placed an advertisement on 46 Seattle buses that replicates half the most-wanted terrorist list between two taglines: "Faces of Global Terrorism" and "Stop a Terrorist. Save Lives. Up to $25 Million Reward." Jim McDermott, a local left wing congressman, wrote in protest to FBI Director Robert Mueller about his "deep concern" that the ad is racist. According to him, the "ad featuring sixteen photos of wanted terrorists is not only offensive to Muslims and ethnic minorities, but it encourages racial and religious profiling. Representing terrorists, however, from only one ethnic or religious group, promotes stereotypes and ignores other forms of extremism. 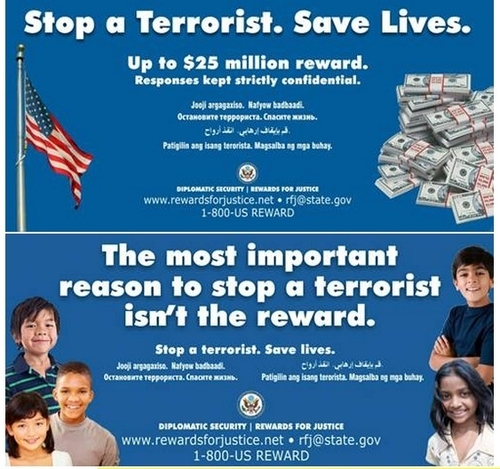 The FBI's 'Most Wanted Terrorists List' includes individuals of other races and associated with other religions and causes, but their faces are missing from this campaign." McDermott argues that the "bus ad will likely only serve to exacerbate the disturbing trend of hate crimes against Middle Eastern, South Asian, and Muslim-Americans." Showing reality offends some people; a bus in Seattle. McDermott also noted that only two of the thirty-two Most Wanted Terrorists are not Muslim. June 25, 2013 update: McDermott gets his way and the JTTF bus ads will soon be taken down. Ads without photos will remain. These ads are deemed acceptable and remain on the buses. Comment: Reality is too much for some people to handle. Sadly, they have real power. Congressman McDermott's comment [is what] I actually find offensive. This is ignorance beyond the pale. When the FBI puts up pictures of individuals that happen to be on the list, those photos need to come out and those are the most recent. I'm trying to figure out how the FBI does its work and somehow also has to be concerned about political correctness. Whereas McDermott said, "You look at the pictures, they're all one color of folks." Jasser pointed out that "a number of those individuals are white, they're Caucasian." Your writer's recent perfumed ode to the Koran made for blissful reading in the garden on a sultry summer day. I felt a wonderful drowsiness as I read that Islam is transcendence and love. Sleep overcame me and I was transported to a magical land of make-believe where 30 of the 32 names on the FBI's most wanted terrorist list were not Muslim. Truly, a wonderful dream. Apr. 23, 2014 update: According to the communist-affiliated Center for Constitutional Rights, of the 178 prisoners in the Bureau of Prisons' Communication Management Units (CMUs), the most restrictive prisons in the federal system, 101 are Muslim. Mar. 15, 2017 update: The addition of Ahlam Aref Ahmad Al-Tamimi (who helped bomb a Sbarro restaurant in Jerusalem that killed 15 and wounded over a 100) offers an opportunity to review the Most Wanted Terrorist list. It now includes 29 individuals: all but two of them (Daniel Andreas San Diego and Joanne Chesimard) are Muslim, just as was the case in May 2013, when Chesimard was added to the list. The Most Wanted Terrorist list as of Mar. 15, 2017. Apr. 12, 2017 update: In contrast to the "Most Wanted Terrorist" list, with just 32 individuals, the U.S. Treasury Department's "Specially Designated Nationals and Blocked Persons List," updated today, contains 1,028 pages, each with multiple entries per page. Although not as overwhelmingly Muslim as the terrorist list, it is very largely Muslim. Is there a volunteer willing to count the names and figure out the precise percentage? 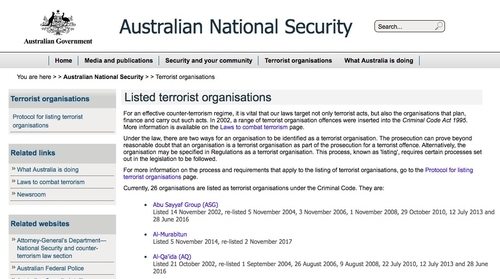 Sep. 29, 2018 update: The Australia government lists 26 terrorist organizations; of them, all 26 are either Islamist or Muslim. Comments: (1) Where is the fig-leaf non-Muslim group? Surely, this needs fixing. (2) Bravo to the Australians for playing this straight. (3) This list establishes with unique clarity whence political violence comes.